It’s time to get a flu shot and being on the road all the time isn’t an excuse anymore for avoiding that task. Especially since, as I wrote in my column on USATODAY.com this week, there are more than 23 airports where you can get a flu shot on the fly. Robert Gibbs stays busy running his marketing agency and says finding time to nail down a doctor’s appointment is getting harder and harder. 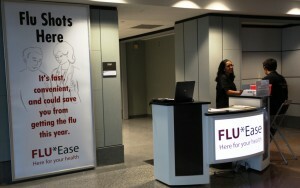 First marketed to travelers by the medical clinic at Chicago’s O’Hare International Airport seven or eight years ago, in-airport flu shots are being offered this year at clinics and temporary kiosks at close to two dozen airports stretching from Los Angeles to Miami. Starting in November last year, there was a nationwide shortage of the seasonal flu vaccine because pharmaceutical companies switched to making vaccines for the H1N1 virus. This year, the vaccines are combined and there’s no shortage. But Jeff Butler of Flu*Ease, the company operating flu shot kiosks at more than a half-dozen airports, says airport flu shots don’t seem to be selling as robustly as they have in past years. “I don’t know whether it’s the mild weather, last year’s frenzy over H1N1 or the fact that people now have access to flu shots in so many stores and corporate offices,” says Butler. That isn’t stopping some airports from expanding their flu shot offerings. This year, San Diego International Airport has five vaccination stations in operation throughout the terminals. Four stations are located post-security, but one station is in a baggage claim area to make it easy for meeters and greeters, and passengers picking up checked bags, to get vaccinated while they wait. And at New York’s JFK Airport, Harmony Pharmacy is waiting for the final OK to open a second flu-shot station; this one in the center of JetBlue’s Terminal 5, by the performance stage. To see which airports are offering flu shots – at clinics or at temporary kiosks – scroll down to the bottom of the article: Get your flu shot on the fly at an airport near you. You’ll find a chart listing listing locations, hours and prices for flu shots at 23 airports.